Alcoholism is one of the most common and prevalent conditions in the world. Each year, millions of people are afflicted and many lives are ruined or put on hold. Despite the popular opinion of many, alcoholism is very much a real disease and is viewed as such by the medical community. Also known as alcohol addiction, abuse or dependence, alcoholism is a disabling disease that is characterized by having the need to drink alcohol – often in excess – despite its effects on the body or mind. Fortunately, alcoholism is treatable and even curable. However, it is crucially important to understand the disease as thoroughly as possible if one plans to overcome alcoholism. If someone’s parents or grandparents suffer from alcoholism, there is likely a greater chance that he or she will have problems with the disease at some point. Many health care professionals believe that alcoholism actually skips generations. Genes can play a large role in the development of alcoholism. Some people are born with genes that can greatly influence how alcohol is metabolized in the body, which can contribute to the onset of alcoholism. Many people believe that these genes can even be developed if one begins drinking alcohol at an early age. While not necessarily causes of alcoholism per say, there are many factors that can easily contribute to exacerbation of the disease, especially if one is already prone to drinking. Stress and anxiety are extremely common among alcoholics, and many people believe that these conditions can lead one to self-medicate with alcohol, hence furthering the already present alcoholism. Depression is another factor that leads people towards alcohol, and can actually be worsened by excessive intake. Any type of mental health issue can lead to dependency and substance abuse issues – this should not be overlooked. In terms of symptoms, alcoholism is in some ways difficult to diagnose. In this way, it is very much related to depression, anxiety and other forms of drug addiction. Speaking plainly, excessive dependence and tolerance of alcohol is what truly characterizes the disease. However, there are often many signs and symptoms that go along with this. In terms of physical symptoms, there are usually many associated with alcoholism. On the more common and less serious side of things, people suffering from alcoholism often have low energy levels, which can drastically affect their quality of life and ability to function properly. Alcoholics are often afflicted with dizzy spells, nausea and headaches. Many of these symptoms come from a phenomenon known as withdrawal syndrome. As the body begins to acclimate to the presence of alcohol, the brain begins to produce smaller amounts of a chemical known as GABA. GABA can be thought of as the brain’s natural sedative and relaxant. Since the alcohol is taking over this role, the brain decides it no longer needs normal amounts of GABA. However, when one stops drinking and the alcohol no longer has any effect, the brain is still stuck with a GABA deficiency, which can cause a wide variety of withdrawal symptoms such as mood swings, shakiness, anxiety, depression and panic. In serious cases, alcohol withdrawal syndrome can even lead to death. Long term, alcoholism can cause many life threatening issues and symptoms, such as liver failure, cardiovascular problems, severe depression, and central nervous system damage. Often times these symptoms do not show themselves until later in life, but sustained, heavy drinking can cause them to manifest earlier on. Women are especially at risk for long term problems, as alcoholism can substantially increase the risk of developing breast cancer. Perhaps even more prevalent than physical symptoms, psychological symptoms of alcoholism can be devastating. It is not uncommon for someone who drinks heavily on a daily basis to experience a decline in their cognitive abilities over time. 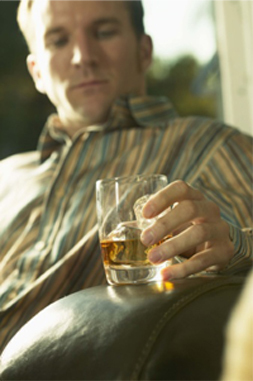 Alcoholism can also affect one’s balance and fine motor skills, sometimes significantly. Excessive alcohol abuse can lead to severe mental issues, such as schizophrenia and psychosis. Alcoholism can be very elusive in that while one may not show specific symptoms relating to the disease, there are often behavioral signs that can point towards the start of a potential problem. For instance, many people who suffer from alcoholism get anxious or nervous if they are in a position where they will be unable to drink alcohol, especially if it is for an extended period of time. Drinking alcohol in the morning can also be a sign of a potential alcohol problem. Tolerance, as well, can be a sign that one is moving towards the realm of alcoholism. Tolerance is basically the body’s way of letting you know that it is no longer content with the amount of alcohol it is getting and requires more to reach the same effect. Tolerance will only go up as long as one continues to drink at a steady level, which is why many health care professionals encourage people to take breaks from drinking. Other signs of alcoholism are invariably related to mood and mental state. For instance, someone who suffers from alcoholism may exhibit signs of drastic mood swings. The bipolar-like shift from happiness to sadness is a sign that the brain is unable to handle the shift from intoxication to sobriety. It is not uncommon for depression to result from this type of situation. Fortunately, alcoholism is considered to be a fairly preventable disease. This is not to say that people who exhibit multiple risk factors will not have a difficult time avoiding alcohol, but there are many small steps that can be taken that will usually make a difference no matter what pre-existing conditions are present. Perhaps the most important thing one can do to avoid going down the road to alcoholism is to exhibit extremely strong willpower, as this can often be 90% of the problem. Limiting your drinking to one to two drinks per day, or stopping altogether if you feel as if you might have a problem is considered good practice. Changing one’s habits is never easy, and can often be accelerated by making lifestyle changes. For instance, if someone is used to heading to the bar every night after work and has done so for ten years, cutting back or quitting drinking altogether will not be easy. Replacing bad habits with good, such as exercise, dance or meditation is considered the best way to control addiction issues. Sometimes it takes a little extra help when dealing with substance abuse issues and the potentiality of alcoholism. In this case, making an appointment with a substance abuse counselor can be extremely helpful. Counseling often has a stigma attached to it, but the fact is it saves thousands of lives every year, and can make a world of difference in terms of getting back on track. No one should ever feel bad or embarrassed about seeing a counselor for any reason. Testing/diagnosis of alcoholism can be very difficult and is often somewhat trial and error. Because the disease is largely behavior based, diagnosis is not too dissimilar from that of mental illnesses such as depression and anxiety. Often times, health care providers will ask patients to fill out a descriptive questionnaire regarding their drinking habits, which is sometimes used as the basis for a diagnosis. There are many different types of screenings that exist, and occasionally multiple questionnaires will be administered in order to hone in on the problem. It is also possible to determine whether someone may have an alcohol addiction by administering blood and urine tests. While there is no “yes/no” answer with these type of tests, alcoholics tend to have elevated levels of AST and GGT in their bodies, which can be detected by simple blood or urine tests. Again, these tests will not spell out whether someone is an alcoholic, but when combined with other testing methods can be helpful and effective. Although they are still relatively infantile, there are many tests that are starting to emerge that can decipher whether or not one actually has a predisposition towards alcoholism. These tests tend to focus on genetic profile and alleles that relate to dopamine sensors, which are affected by alcohol use. Scientists and the medical community are hoping that in the near future these tests will be more versatile and accurate, but they are quite useful as they stand now. Alcoholism is somewhat of a difficult disease to treat, in that it is more “managed” than it is treated. This is not to say that there are not many ways to manage the illness, as there are. Different management options work differently for different people; suffice to say, treatment is very personal in nature, and one should not give up if specific options do not work for them. There is a treatment option for everyone; sometimes it just takes a bit of trial and error to find the correct one. For those who are severely addicted to alcohol, detoxification is an option for treatment. Detoxification usually consists of a rapid or abrupt cessation of alcohol intake. Occasionally the alcohol is replaced with tranquilizers or sedatives that act in similar ways upon the brain; this can make cessation less troublesome and irritating for the alcoholic. Detoxification is not without its dangers, and should never be attempted outside the care of a medical professional. Unmonitored, rapid detoxification can result in seizures and/or death. Perhaps one of the best treatments for alcohol abuse is therapy; either group therapy or private therapy. As alcohol addiction is very heavily rooted in cognitive function, therapy can be helpful in not only figuring out why one has an alcohol problem but also in working out a cessation or management strategy. Specifically, Cognitive Behavioral Therapy (CBT) is extremely effective in treating alcohol abuse, as the basic tenant of the therapy is to change negative behavior to positive behavior. While not everyone responds to CBT, it is certainly a strong option to consider, and has virtually no side-effects. 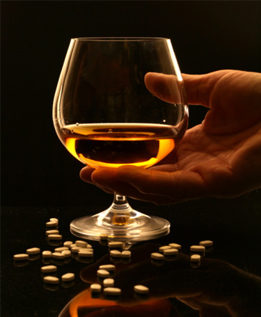 There are also certain medications that are used to combat alcoholism. Disulfiram, also known as Antabuse is one of the most commonly used medications for alcohol addiction. It basically functions by inhibiting the body’s ability to metabolize a byproduct of alcohol called acetaldehyde. Acetaldehyde is thought to be one of the primary contributing factors to the phenomenon of a hangover, and those who drink while taking Antabuse will experience a rapid onset hangover that leads to extreme discomfort. The concept of the drug is to discourage the user from drinking alcohol, as doing so will cause nothing but negative effects. The ethics and efficacy of Antabuse are questioned by many health care professionals, and side-effects such as drowsiness and nausea can be extremely problematic. Another drug used to fight alcohol abuse is Naltrexone. The way this drug works is it basically blocks opioid receptors in the brain, which inhibits any pleasurable effects from drinking alcohol from occurring. The use of Naltrexone is supposed to curb cravings for alcohol as it will no longer have the same effects on the user as before taking the drug. Naltrexone is considered a safer alternative to Antabuse, in that it doesn’t produce unpleasant effects. The Sinclair Method is a treatment method that focuses on combing continued drinking along with the implementation of Naltrexone, and is considered an effective method of treatment. Benzodiazepines are commonly prescribed to people who are trying to fight alcohol abuse and being cessation, however there are many potential problems that go along with this method. Since benzodiazepines work almost identically on the brain as alcohol, it can simply become replacing one addiction with another. Also, the combination of benzodiazepines and alcohol can be fatal, especially if combined in large amounts. Lastly, benzodiazepine cessation is considered to be harder than that of any other drug in the world, and can create lasting problems for the recovering alcoholic. While not necessarily widely accepted by the medical community, there are many herbal supplements that are available to those who would like to cut down on their drinking. These are normally not meant for people who suffer from sever alcoholism, but are geared more so towards people who feel as if they might someday have problems with giving up alcohol. Vitamin B complex is widely regarded as helpful to reducing cravings and elevating mood, as is 5-HTP. Valerian root, which should never be taken with alcohol, is a natural sedative that is sometimes though to be helpful as an alcohol replacement. St. John’s Wort is an herb that has natural antidepressant qualities and may be effective in reducing cravings and keeping one on the path to cessation. Of course, none of these supplements are federally regulated, and each comes with its own set of side-effects. Be sure to speak to your doctor before deciding to try any of these supplements as alcohol cessation aides.